President Joe Caruso chairs the WAS Board. Other RCM members who are active on the WAS board include Jim Dorman, Bill Coleman and Steve Chevalier. Each year the seminar is organized around a timely and significant theme. In 2018, the theme is “Innovation – Shaping the World You Will Inherit.” It will include experts sharing insights and views ranging from cutting edge science to centuries old traditions. Participants will take field trips to places where innovation takes place to explore the impact on our community. Delegates will work together to define issues and problem areas related to innovation. They will discover what they can do to make the changing world a better place. Ten deserving students from the Milwaukee area will have the opportunity to attend the 2018 World Affairs Seminar (WAS) from June 23rd – June 29th at Carroll University thanks to a contribution of $5,900 from the RCM Community Trust. To get a scholarship application for a Milwaukee student who does not have the means to attend, please contact the Rotary office. Student applications are due at the end of April and awardees will be announced in May. Kiwanis Club of Milwaukee’s 2018 Hall of Fame Award. Established in 2005, the award honors a Milwaukee organization for its long-standing corporate citizenship and commitment to the long-term betterment of the Milwaukee community. To learn more about the World Affairs Seminar visit www.worldaffairsseminar.org. 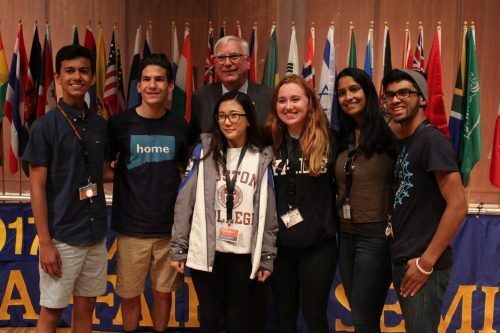 Students had the opportunity to meet Rotary International President Ian H. S. Riseley at the 2017 WAS.